Reimagine the way your ideas come to life. 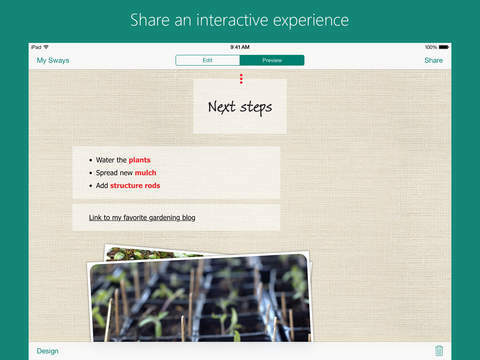 Sway is an intelligent app that helps you easily create an interactive web-based canvas of your ideas, and then share it with friends, family, teachers, and coworkers. On your iPhone, pull together your pictures, videos and text in minutes, and the built-in layout engine will craft a cohesive look and feel that looks great on any screen. Or modify an existing Sway while you’re on the go. Use Sway to easily create and share a polished, interactive, web-based canvas of your ideas with family, friends, teachers, and coworkers. 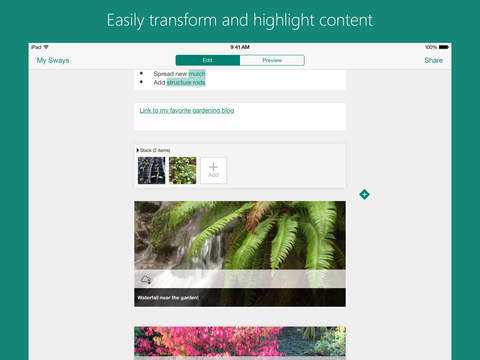 Sway makes sure your creation looks great on any screen. 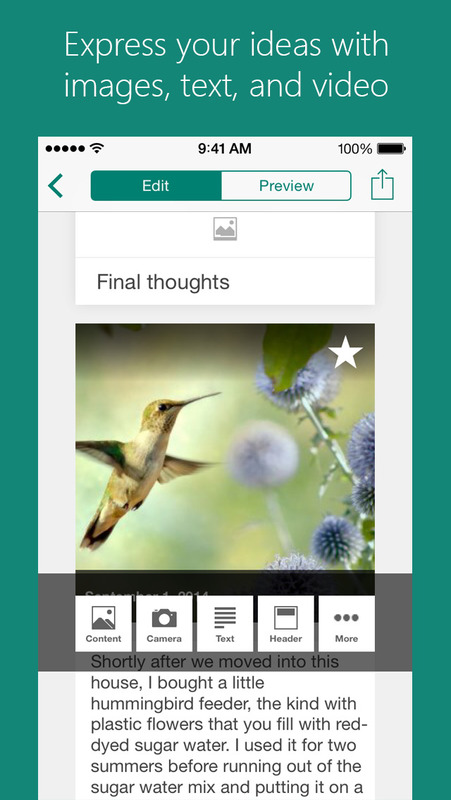 •	On your phone, it’s simple to combine headers, text, pictures and captions to start bringing your ideas to life. Use voice dictation to easily add text while on the go. On your Mac or PC, you can pull together your content from OneDrive, your devices, social networks, and the web. •	Share your Sway through social networks or email, and your family, friends, teachers, and coworkers can see your creation on the web without needing to download any additional software. 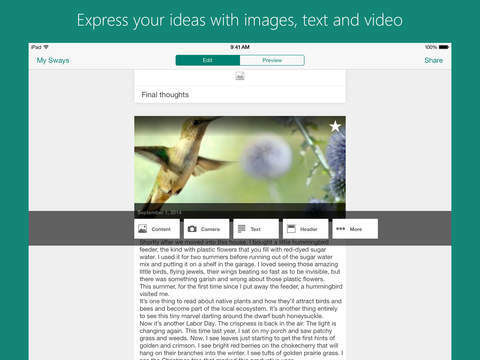 •	Your creations look engaging and inspiring on any device. Whether your audience is using a phone, tablet, computer, or large screen, Sway automatically adjusts the layout so that the results look gorgeous. 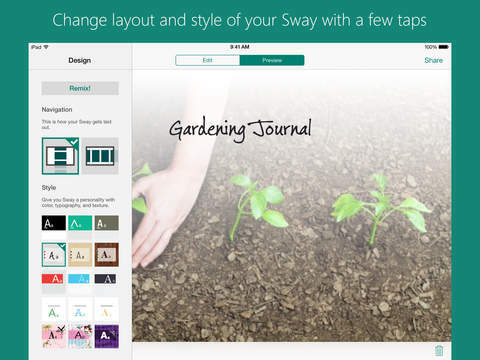 Sway’s built-in design engine takes the hassle out of formatting your content by integrating it into a cohesive layout. From there, you can easily adjust the style to create the desired look and feel. •	Simply tell Sway what images and text you wish to include, and your content is automatically formatted into a polished, cohesive design as you go along. 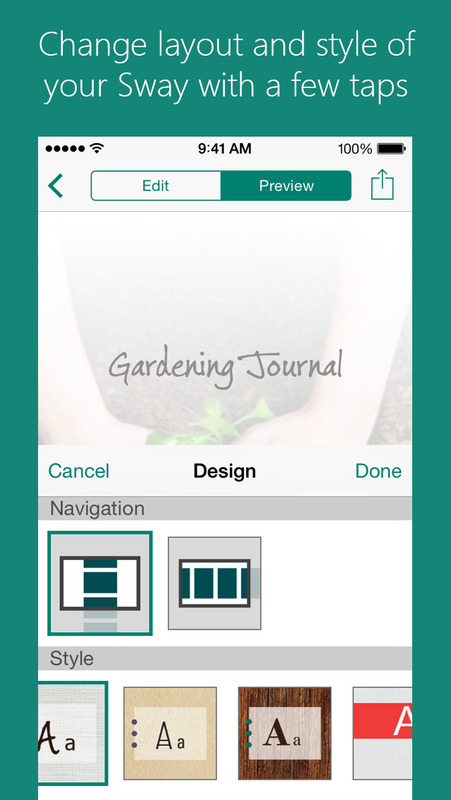 •	Change the overall layout of your creation with just a tap of the “Mood” button. 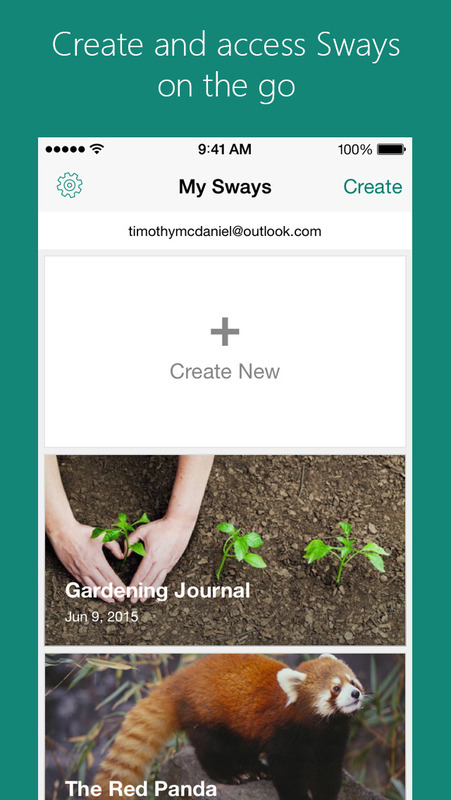 Sway does the work to automatically adapt the formatting of your creation to your desired layout. •	It’s easy to make adjustments to your creation, such as changing an item’s emphasis, or dragging your content around to restructure it. Sign in with a free Microsoft account to view or create Sways.